Consider yourself a serial shopper? Here's your chance to put that buying talent to good use! 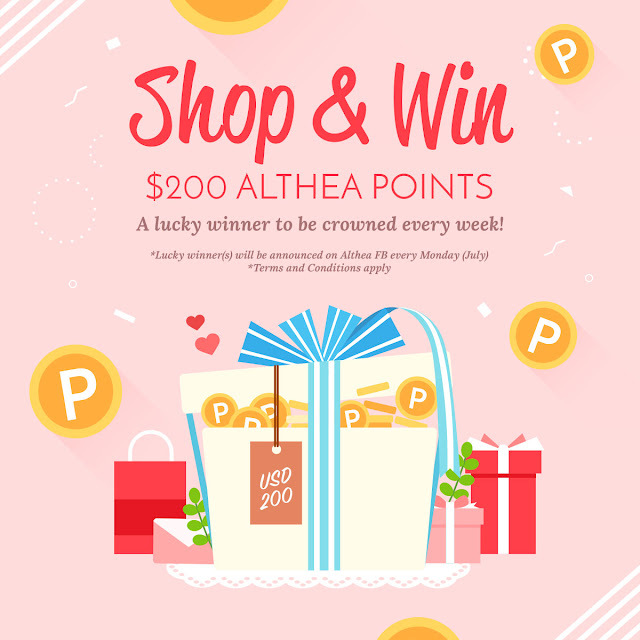 The Shop & Win Contest will be running in the month of July and we will be picking one winner each week per country domain to win some Althea shopping credits (6 winners per week)! All you have to do is shop from Althea during that period to stand a chance to win $200 in Althea credits, it's that simple. Get ready to shop till you drop! The contest runs from 3rd July to 30th July 2017, and the dates of winner selection are stated in the terms and conditions below. Good luck! The Althea Shop & Win ("Contest") is organised and run by Althea Korea. 1. The Contest is open only to shoppers of Althea Korea. 3. Participants who purchase any products from Althea from 3rd July – 30 July 2017 are eligible to enter this contest and/or claim prize(s). 2. Winners and prizes are decided based on random so long as they shop on Althea’s website within the contest period. 5. Subject to the terms and conditions herein, there will be a total of 4 prizes to be won: One prize of Althea shopping credits worth RM1000, SGD 300, PH10,000, IDR3,000,000, TH8,000 or USD200 according to the country of the winner for each week of the contest period. Hi! Unfortunately that's up to our fairies in K-land and out of our control :( Don't worry, we'll put in a good word for ya. ;) Meanwhile, be sure to check out our latest offerings on Althea! Hello! This blog post doesn't really explain how to enter the contest. Does it work like this: as long as you make a purchase on Althea within the month of July, you are automatically entered into the contest? Or is there an extra step that you need to take to enter the contest? Thank you for entertaining my question! Hey there, it's as simple as shopping on Althea, that's it! :) For more info, please click and read the T&C. Hope this helps! Hello, it's already been announced :) Congrats to the winners!